NORMAN, Okla. — A Muslim man who beheaded his coworker three years ago and attempted a decapitate a second woman has been sentenced to death after a jury determined that he was eligible for capital punishment. “I can’t bring Colleen back, and it’s unfortunate that another life will be taken. May God have mercy on your soul,” Cleveland County Judge Lori Walkley declared on Dec. 15 after handing down the sentence to Alton Nolen, 33. She also thanked the survivors and the family members affected by the attack for their courage during the trial. According to those present in the courtroom, Nolen kept his head down and remained expressionless while being sentenced. 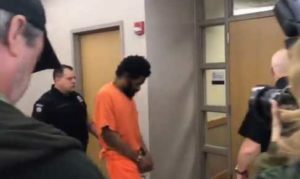 As previously reported, Nolen was found guilty of first-degree murder in September, as well as four counts of assault with a dangerous weapon and one count of assault and battery with a deadly weapon. His attorneys had entered an insanity plea, but it was rejected by the jury. Recorded audio of the 2014 police questioning of Nolen was played for jurors, during which he expressed no remorse and said that he was only doing what he believed Allah wanted. Nolen carried out his rampage in Sept. 2014, days following his suspension from Vaughan Foods in Moore over alleged comments about Caucasians. According to reports, he entered the front office, where he encountered Colleen Huffort and began attacking her with a knife. Some psychiatrists testified during the trial that Nolen was mentally ill, while others stated that he acted with full knowledge that his behavior was wrong. Courthouse News reported that Dr. Antoinette McGarrahan told the court that she believed Nolen had “numerous indications of mental illness” as he would say “in the name of Allah” in odd placements during her examination, and remarked that he was feeling tempted by her exposed feet. He also called her an infidel. However, Dr. Jarrod Steffan came to a different conclusion. In October, a jury sentenced Nolen to life in prison surrounding the assault charges, but also recommended the death penalty for the crime of first-degree murder, finding him eligible for capital punishment. Survivor Traci Johnson advised during that time that she prays for Nolen.